If you’re going to a party, it’s not cool to show up empty handed. Sure, you can pick up a bag of chips and salsa OR you could make something tasty and delicious…. Some call it a Kebab. Some call it a Skewer. We call it…Steak on a Stick! We can’t think of a better combination than steak and the Super Bowl. But steak is expensive, right? Well, it depends….mostly on the cut and grade of beef. In this recipe we’ll use Flank Steak, an economical but tender cut, and show you how to become the MVP of your Superbowl pary! How to you prepare to party for the big game, without crushing your bank account? The key to this recipe begins with buying the right steak. Sirloin, flank or, or skirt steak are all ideal cuts for this recipe …they’re economical, they’re versatile, when cooked right, they’re tender – and tenderness is important. Although flank steak which is very similar to the skirt steak, we used flank here because, it’s just easier to find at the local grocer…. and it has really great flavor. However, you can substitute this with skirt or sirloin steak. The PERFECT Super Bowl Snack! 2 LBS Flank Steak Sliced into strips 1" wide. Slice against the grain. Place wooden skewers into water and let soak for at least 20 minutes. Cut chilled Flank Steak into 1" strips. Cut steak against the grain. See video for directions. Run skewer through the center of the steak strip. See video for directions. Pour extra virgin olive oil over Steak on a Stick. Coat thoroughly. Season steak with Big Tasty Steak Rub (http://redmeatlover.com/recipe/steak-seasoning/). Heat charcoal or gas grill to high heat. 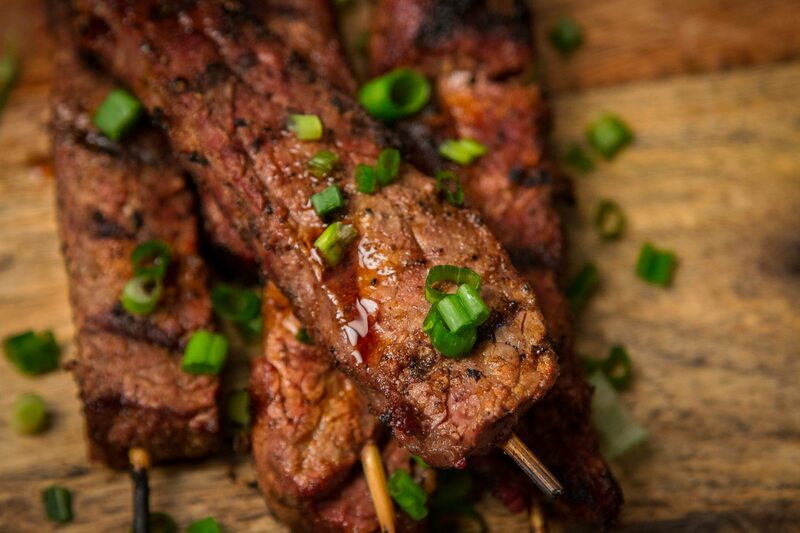 Cook steak sticks over high heat for about 1-2 min / side, flipping and rotating (over highest heat) as necessary. Allow to cool for 2-3 minutes before eating.